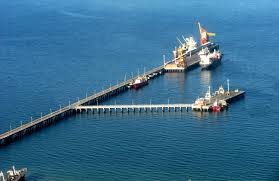 Nº 1 Berth, the principal berth, is situated on the north side eastern end of the pier, length 217 m and is used by bulk carriers supplying alumina, and occasionally pitch, to the aluminum plant. 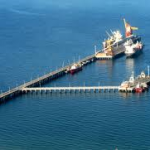 A conveyor belt runs the entire length of the pier to the plant, and at the berth a new aspiration unit discharges alumina from the ships to the belt, when required, pitch can be discharged by grabs to open trucks. When not used by vessels discharging to the Aluar plant, the berth is available for other vessels, however it should be noted that the apron is somewhat narrow for working cargo. The Nº 2 and Nº 3 general cargo berths lie on the south side of the pier, opposite to Nº 1 berth. Of the two, the Nº 3 berth is the handiest for working cargo due to its proximity to the causeway and its considerably greater quay space; this berth was extended for 67 m, giving a total length of 197 m. In study is a project to upgrade berth Nº 2 widening it up to about 43 m.
The Nº 4 berth, situated on the south side towards the western end and alongside the causeway itself, consists of 7 independent dolphins, giving a berth frontage of 180 m. Originally conceived as a lay by berth, it is now reserved for the exclusive use of fishing vessels which, apart from laying by, storing and carrying out repairs, discharge their catch to trucks on the causeway with the assistance of mobile cranes. Berth Nº 5 and Nº 6: As indicated on the A. Storni Pier plan, this two berths are at a pier for fishing vessels, south side 156 m noth side 142 m length, both 29 m wide, for vessels up to LOA 80m; a viaduct 195 m long and 9 m wide connects it to the main causeway, including a slop reception system at pier.